Sorry to start a new thread, but I am really not sure if my Eclipse pen is a one of Finstone's pens, so would like to share with you some pictures and ask about your opinions. I bought this pen few years ago and completely forgot about him until today. From the very first view, I thought "well, Moore-like eyedropper" but a little later it tourned out it's a sleeve-filler. Surprise! There is an interesting bar inside, at least I've never seen such one before. The last thing - the imprint. Faded, but readable with light. Note the used font. Have you ever seen similar before? I would be very grateful for any help - manufacturer, period of production, any opinions. Can you read the patent number on the sleeve-filler? It is difficult to make out the number from the picture. Looking that up in google patent search would help. Also, can you make out the second line in the imprint? That might help as well. I would not assume that it was a Finestine Eclipse product, though it is possible. If so it is an incredibly early and rare find. However, a lot of pens were sold in the 1900-1920 range with model names only, and did not have much information to identify the company. Sears catalogs from 1910-1920 tend to have several pens with model names like "The Peerless", "The Wabash", "The Perfection", "The Professional" - all of which were made by Aikin Lambert, but only inscribed with the model. It is quite possible this was a small run of pens for a retailer, a jobber who put together parts, etc. The patent may help, but the bar is imprinted "Licensed Under" - which means that the maker of the pen did not own the patent. Thank you very much for so great info, especially that Aikin Lambert is aslo among my interests:) Anyway, it was really hard to read patent number, but I polished the bar and here it is: PATENT 791,649. I also noticed "Licensed Under" but maybe knowing the patent owner we would be able to find manufacturer somehow, hope so. As to the imprint second line, probably it will not help much since there is only: SELF FILLER SAFETY PEN. I have tried to take picture but it's so faded that I was not able to take good enough shot. Alas, US patent 791649 is for an apparatus for molding playing balls. I could not find anything in the international database either. It's the best picture .... well, maybe there is 8 not 9 on second position? Not sure it gets us much closer to a manufacturer. 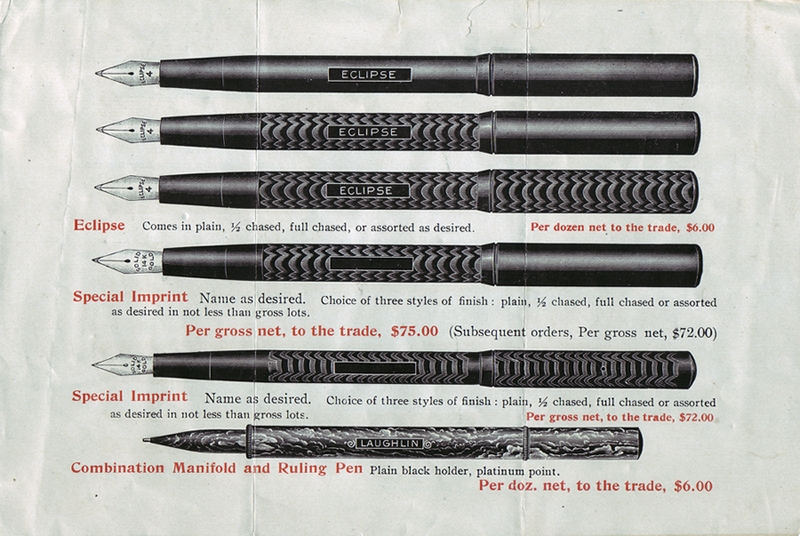 The Sterling brand pens and other sleeve-fillers made by Davidson Rubber Company used a much later sleeve-filler patent, according the the Lion and Pen database. At least this gives you an earliest manufacture date - it had to have been made after Feb 7th, 1905. Yes:) Many thanks! Am thinking about the shape of this pen, which obviously reminds Moore's Non-Leakable pens. Don't know, but maybe the manufacturer of this pen is from Boston area, hum? No info to add but I am now really curious too! Wow! Steve, wonderful! Think we have same pens but yours is in wonderful condition. The same imprint, thanks to you now I know there were "Boston" on mine some day:) Thank you very much. Would you please be so kind and tell me more about the nib. I have Warranted 14 KT 3 nib and would like to know if it's replacement or not. Edited by coffe_cup, 09 March 2010 - 20:10. Yes the Eclipse marked nib came with it. Super Flexi. Though it is curious that the nib is marked N.Y. and the pen is from Boston. Not much more info from me. Edited by AllWriteNow, 09 March 2010 - 21:00. The Finestone Eclipse company was based out of N.Y. so it is possible that the NY nib was a later marriage. The shape of the logo bears some resemblance to the Finestone Eclipse logo that sometimes appeared on the levers (ECLIPSE in an eye-shaped elipse). But that is not definitive by any stretch. It is also possible that the pens were made in NY and Boston was used as a selling point or a model name. You and your buddies have been very busy on this mystery. Having collected every Eclipse pen that I encountered, indiscriminately, I am overjoyed to see yours! I had one, and it was one of only two I ever saw. It is a thumb filler patented in 1905 by one Robert Hamilton, who was an officer of the Standard & Vulcanite pen company of Brooklyn. The company was later purchased (1918 if memory is correct) by the Crocker family, and operated as the Chilton Pen Co for a year or two, before moving to (gasp) Boston. The Hamilton patent went with it. It is possible that Chilton sold some pens that had been previously marked Eclipse, and didn't want them associated with the Chilton name. The reason I say that is that the Laughlin Company of Detroit definitely sold some Eclipse pens as a lower priced line. There is a pen-myth that Laughlin contracted to make a quantity of pens for Marx Finstone, the Eclipse founder, and Finstone failed to pay, so Laughlin was stuck with a ton of pens already imprinted with the Eclipse name. It's a nice fit and not hard to believe, but if true, there must be some court documents somewhere. My version of this mystery pen was purchased from a collector in the UK. It was marked Eclipse along with the name of Britain's largest "chemist" whose name slips my mind (and marked made in USA). Jim Marshall told me that the drugstore chain sold pens from anybody who would supply them cheaply enough, and cheap was Marx Finstone's middle name. He worked for at least one pen company before starting his own operation. My theory is that he purchased pens from S&V early on, since they were all in Brooklyn, and very few self fillers were available prior to 1910. His first wife was from the UK, and it's possible that he had connections to some businesses there. That's all I have for tonight, but I'll get back if I remember anything further of consequence. JB emailed me this info re: the nib on my pen. I guess yours is the original Marta. That nib must be a replacement. It originated about 1924, and Chilton had moved back to Boston about 1920. I'm assuming all the thumb fillers were manufactured prior to the advent of the pressure filled Chiltons. After 1920, they shouldn't have had any access to Eclipse nibs. Eclipse wouldn't even use them on their low line pens, and never went across the board on their Eclipse branded ones. Prior to 1920, there was a very scarce Eclipse marked nib that used a plain text Eclipse engraving. For most of its life, even into the 1930's, the "warranted" nib was the Eclipse standard. It's interesting that as cheap as Finstone was, he never sold anything but 14Kt nibs after about 1915! Not even on pens he brand named for other companies or his Park Row & Marxton cheapies. That football logo on your nib started in the early 1920's on the clips. All the Eclipse marked nibs had that logo once they started using it. Thanks for the info - and nice to see you here! I haven't had a good chance to talk Eclipse for a while. Wow - so this one is Standard and Vulcanite. I wonder if that means that the Boston version is a late one from shortly after the move. It would make sense - the Boston imprint looks like an ad-on. I will have to check my files - I know I have some Standard and Vulcanite pen ads somewhere. RE Eclipse nibs - Any thoughts on whether the Parkston pens are Finestone productions? They had plated nibs, but otherwise the styling and parts are very Eclipse - even the gap-tooth feed. A few years ago Antonios Zavaliangos showed me some pictures of this "Dainty Nile" fountain pen. At the time I had not heard of that model name before, but now with all this information it might be possible to make a guess that it was made by the Standard & Vulcanite Pen Co., or the Eclipse Fountain Pen Co. It has a simple Warranted 14KT nib, and the imprint byline "Self Filling Safety" just like the Eclipse pens. The Hamilton patent was used by the Standard & Vulcanite Pen Co., in which Hamilton was one of the directors, but the patent was licensed to and appears on some pens made by the Eclipse Pen Co., Moore Pen Co., and Edward Todd & Co., and on the "Dainty Nile". Hi George, JB Roede, John, et al. Are there any other patents on the similar filling mechanism? I see the difference between sleeve's fixing. The reason I say that is that the Laughlin Company of Detroit definitely sold some Eclipse pens as a lower priced line. There is a pen-myth that Laughlin contracted to make a quantity of pens for Marx Finstone, the Eclipse founder, and Finstone failed to pay, so Laughlin was stuck with a ton of pens already imprinted with the Eclipse name. It's a nice fit and not hard to believe, but if true, there must be some court documents somewhere. I don't own court documents, but this is a scanned image from a Laughlin Mfg. sales flier, documenting Eclipse pens being dumped at USD $.50 each. I would venture to say that Martha's Eclipse was manufactured by The American Fountain Pen Co. maker of the Moore safety pen, and branded it Eclipse. Edited by sztainbok, 01 February 2012 - 17:50.